Eastern equine encephalitis (EEE) is a rare but serious disease caused by a virus and spread by infected mosquitoes. The disease most commonly affects people and horses, but illness has been reported in other animals including alpacas, llamas, donkeys, pheasants and emus. EEE was first detected in animals in Vermont in 2011 when several emus in a large flock died from a EEE virus infection. The following year the first human cases in the state were reported when two residents of Rutland County were confirmed to have EEE. Since then, no additional human cases have been reported, but two horses in Franklin County died from EEE in 2013. Although EEE virus has caused illness in just a few areas of the state, the virus has been shown to be present in mosquitoes throughout Vermont, so all Vermonters should take precautions to avoid mosquito bites. Symptoms of EEE typically occur four to 10 days after a bite from an infected mosquito. The severity of the illness is quite variable. Some people bitten by an infected mosquito may not become ill. Most people who become ill experience a flu-like illness with fever, headache, muscle aches, joint pain and fatigue. This illness can last one to two weeks. In rare cases, infection of the brain and spinal cord occurs, causing sudden high fever (103° to 106°F), stiff neck, and a headache that keeps getting worse. Inflammation and swelling of the brain, called encephalitis, can occur. The disease can sometimes worsen quickly. About one-third of people who develop encephalitis from an infection with the EEE virus will die. Among those who survive, many are left with mild to severe disabilities. People over age 50 or younger than age 15 are at greatest risk for developing severe disease. There is no specific treatment for EEE. Treatment focuses on supportive therapy to lower the fever and ease the pressure on the brain and spinal cord. There is no vaccine for humans because EEE occurs so rarely in people. There is a vaccine for horses, which can also be used in other susceptible animals. Anyone who spends time in an area where EEE virus activity has been identified is at risk of infection. Although the risk is thought to be low in Vermont, people should take steps to avoid mosquito bites. People who engage in outdoor work and recreational activities, especially near wetlands and swamps, are at increased risk of infection. The risk of getting EEE is highest from late July through September. EEE virus typically infects birds, and in most years it remains in bird populations, posing little danger to humans and horses. Mosquitoes become infected by feeding on infected birds. If an infected mosquito bites a horse, human or other susceptible animal, the animal or person can become sick. The virus that causes EEE is only spread by mosquitoes. People, horses and deer do not spread the disease. The best way to prevent EEE is to prevent mosquito bites These steps will reduce your chance of being bitten by mosquitoes that carry EEE virus or other viruses, such as the West Nile virus. EEE is caused by the most neuropathogenic arbovirus present in the United States. For patients who develop encephalitis, the mortality rate is high and survivors often have severe neurological damage. EEE virus infection in people can be asymptomatic, or it can result in either a systemic or encephalitic infection. Systemic infection has an abrupt onset and is characterized by chills, fever, malaise, arthralgia, and myalgia. The illness lasts one to two weeks. Recovery is complete when there is no central nervous system involvement. Most of the reported cases are caused by an encephalitic infection. In infants, the encephalitic form is characterized by abrupt onset. In older children and adults, encephalitis occurs after a few days of systemic illness. Signs and symptoms in encephalitic patients include fever, headache, irritability, restlessness, drowsiness, anorexia, vomiting, diarrhea, cyanosis, convulsions and coma. Approximately one-third of people who develop encephalitis die, and 50% of those who recover have significant neurologic aftereffects. EEE is relatively rare with only five to 10 cases reported nationally each year. 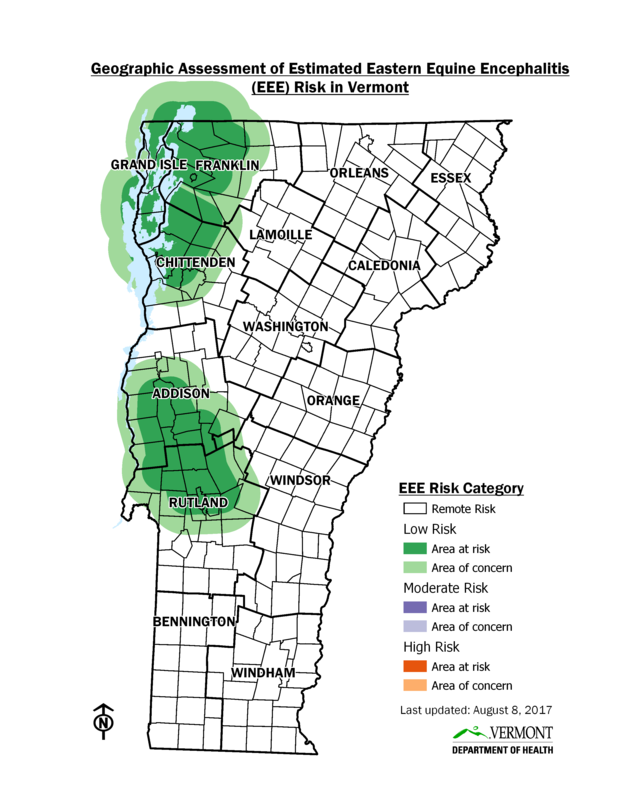 Two human cases of EEE were reported in Vermont in 2012. These were the first-ever reported cases in the state. Both people were from the same area in southern Addison and northern Rutland Counties where EEE virus has since been detected in mosquitoes. No human cases were detected in 2013, but two horses in Franklin County died from this disease. EEE virus was also detected in a mosquito pool collected in northern Chittenden County. EEE virus is likely circulating in many parts of the state, and it is possible that the virus will be found in people or animals in additional areas. In 2010, deer and moose blood collected during hunting season tested positive for antibodies against EEE virus. Out of almost 500 samples tested, about 11% were positive. Positive samples came from deer and moose from all parts of the state. This was the first evidence that EEE virus is present in Vermont. The deer serosurvey was repeated from 2011 to 2013. The deer appear to have a stable seroprevalence at about 10%. In the northeast states, Massachusetts has had the most human cases, and outbreaks have historically occurred in the southeastern part of that state every 10 to 20 years. New Hampshire has had a recent increase in reported cases. Since 2005, New Hampshire has recorded nine human cases. The 2017 Vermont Arbovirus Surveillance Plan is a revised version of the 2015 plan, which was focused on responding to Eastern equine encephalitis virus (EEEV). This 2017 revision continues the focus on EEEV, but also includes information on West Nile virus (WNV). This plan includes information about education, surveillance and guidance about the state’s response to a positive EEEV finding. This plan is based upon the most up-to-date scientific information available and incorporates guidelines from the Centers for Disease Control and Prevention (CDC) and the recommendations of the Vermont Agency of Agriculture, Food and Markets (VAAFM) and the Vermont Department of Health (VDH). The virus is maintained in a bird-mosquito cycle that occasionally spills over to cause illness in mammals, including humans. Mammals are dead-end hosts and do not contribute to the transmission cycle of the virus. The mosquito that is the enzootic vector feeds mostly on birds and lives in hardwood acidic swamps. Transmission to mammals is thought to occur when either the enzootic vector takes a rare mammalian meal or when a “bridge species” of mosquito (one that routinely feeds on both birds and mammals) feeds on an infected bird and then feeds on a susceptible mammal.